I have been passionate about photography for a very long time. My first ‘proper’ camera was an old Russian Zenith B, with no light meter, so I had to gauge the light myself. At the age of 11 or 12, I started developing film and printing photographs on a homemade photographic enlarger made from tin cans and old lenses. You might think that things have changed since then (it was quite a long time ago! ), but many of the basic principles of photography remain the same. I often hear people complain that you need to have a very expensive camera in order to create award-winning photographs, so in 2010 I set out to show that this isn’t true. The location I chose was my back garden, the camera a £300 Nikon, and the subject a frog in a make-shift pond. And here’s the proof that you can do it! 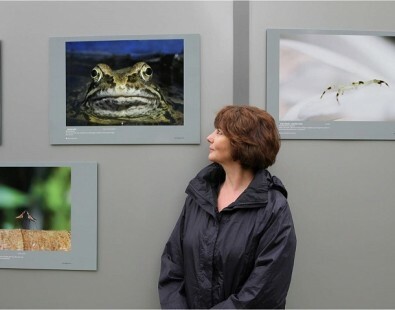 Me with my frog at the start of a major exhibition at Kew Gardens! The image I took with this relatively inexpensive camera reached the final of International Garden Photographer of the Year in 2010. I’ve been successful in other major competitions, but this remains my proudest moment. I hope the following words will help you to improve your photography skills. Once you have set your budget what factors should you take into consideration before buying your camera? Weight is an obvious one, particularly for outdoor photography, so compromises might have to be made. Before choosing, I would always recommend reading several web-based reviews from reputable authors, writing a list of your requirements first. To get you started, here is an explanation of some of the types of digital camera available to you. Compact Cameras (also known as point and shoots) are small, light and are usually relatively inexpensive. Most of them tend to perform less well in low light, in particular the budget models with small sensors, but the compact camera market is changing. Manufacturers are now designing models with larger sensors and improved image quality to compete with the smartphone market, but these come at a price. With compact cameras it is impossible to obtain a shallow depth of field (see below) and there are many other limitations, but this might be the right option for you. Single Lens Reflex Cameras with interchangeable lenses are my preferred choice, but I have, on several occasions, fallen flat on my face because I am carrying too much and looking at my subject not my surroundings! I also miss shots because my camera is wearing the wrong lens. The benefits are, of course, improved quality and more control, but they are not necessarily the best option for bicycle riders! If you like the idea of having interchangeable lenses, but don’t want to break your back it is worth considering a mirrorless camera. Bridge (Superzoom) Cameras offer an excellent compromise and are popular with enthusiasts. With manual and automatic controls and a non-interchangeable zoom lens with a good range, the Bridge is far more portable than the SLR. Due to their wide zoom range, most feature built-in image stabilisation to keep your photographs as sharp as possible. When you are choosing your camera, don’t just look for the one with the most megapixels: more megapixels do not necessarily equate to better quality. The size of the sensor is far more important. Yes, you will need more megapixels if you carry out significant cropping post-production or if you are going to make very large prints, but most of us just do not need the number provided (and they eat up memory!). I use manual settings all the time, mostly so that I can control the depth of field (the amount of the photograph that is in focus), obtain action shots with a fast shutter speed or adjust the lighting. If you want to get the most out of your camera you will need to understand the relationship between the three fundamental elements of exposure: aperture, shutter speed and ISO. I will not go into these in detail, but instead I will let my photos do the talking. If you like what you see I would suggest that you search for the Exposure Triangle on the Web. We hope this is helpful if you are planning to treat yourself to a new camera in 2019! Look out for our next blog where Rachel will give some more tips on composition and lighting.